I think participating in the production of the book "Highfields Remembered" whetted my appetite, and once on the road to remembering it was almost like reliving my childhood days. I find I am constantly remembering events and places I thought I had completely forgotten. 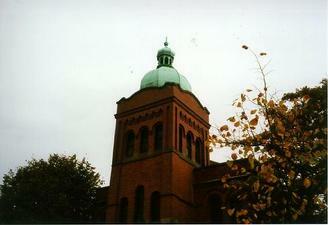 Leicester Synagogue which celebrated its 100th anniversary in July 1997. 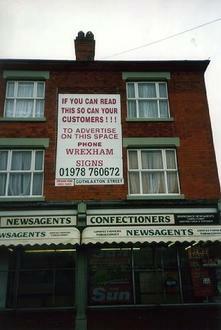 This is situated at the corner of Highfields Street and Tichborne Street. 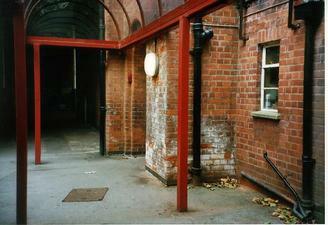 I had some interest in its building, as it is one of the relatively few public buildings remaining in the area. 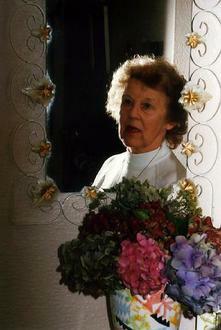 Also the first president was Sir Israel Hart, and my oldest friend from childhood days is his great niece. No: 9 Guthlaxton Street, virtually unchanged, visited this house many times as my mother was friendly with the family living there, the Shellards. The eldest but one of the daughters  coached  me in algebra when I went to Grammar School, and if I remember correctly, recieved 2 shillings a week for this [ about 10p today ]. I also had weekly music lessons with Miss Vines, further along the street, but those houses have long been demolished and replaced. 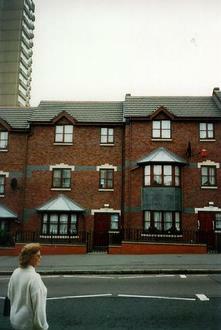 I spent my early childhood at 48 Sparkenhoe Street, long since gone and replaced by the house shown in this photo. I still clearly recall practically every detail of the light brick terraced house, with its neat front garden enclosed with iron railings and a strong iron gate. No electricity, gas on the ground floor, candles for upstairs lighting. At the top of the hill were several shops and also a row of shops at the lower end of the street, which had a very small living area behind the shop, a lean to kitchen and a communal yard. 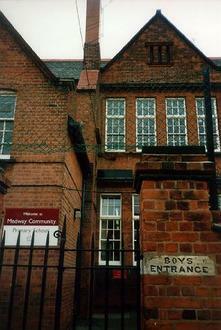 The BOYS and GIRLS entrances were seperate at Medway Street School , and the signs have stood the test of time. I attended this school from 1926 - 1932. There used to be a well suplied sweet shop opposite the school, where you could get such delights as gob stoppers, sherbert fizzes and love hearts which could be purchased for 1/2 penny. There are still shops at the corner of Sparkenhoe Street and Guthlaxton Street. This shop was once Harry Labands funiture store. 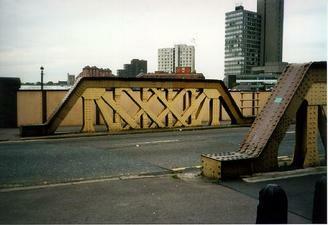 Swain Street bridge, which has remained virtually unchanged. I remember this from my childhood days in the 1920s. Still painted in a muddy sort of yellow colour. 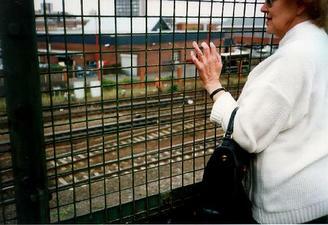 The alley on the right was then known as Bird Cage Walk, possibly due to the long wire fence through which we children used to view the trains passing below. 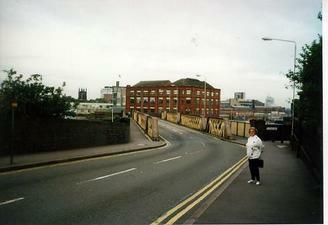 The view from Bird Cage Walk, Swain Street bridge. Small boys used to gather with their paper and pencils, jotting down train numbers and names of the well known engines. 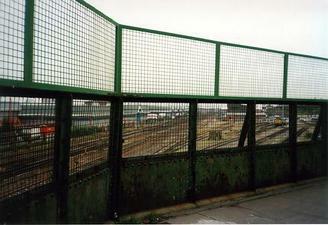 Bird Cage Walk, Swain Street bridge. You used to go through the dark covered area to the area we used to play on wet days at Medway School, or as part of it was known, the once hallowed area of good 'skippers' . I once was allowed to skip there, having proved I could maintain a long period without tripping over the rope at a fast speed and also managing to perform 'Loo Jump' , which involved twisting the rope at a fast speed and jumping at the same time. Skipping was also an aid to spelling, such words as D.I.F.F.C.U.L.T.Y Mrs.D, Mrs.I, Mrs.F. F. I , Mrs.C, Mrs.U, Mrs. L. T. Y,- spells DIFF - I - CULTY [skipping speeded up during last word]. 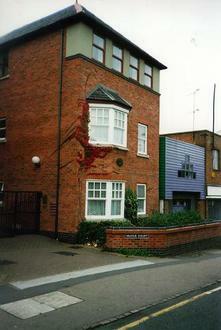 On the left , the entrance to the Doctors surgery, corner of Lincoln Street and Sparkenhoe Street. 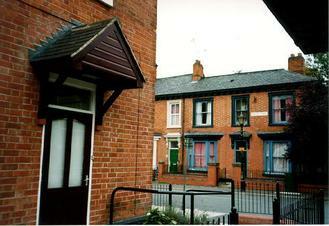 The house on the right of the photo was Mr. Haynes, Vetinary Surgery, in Lincoln Street. 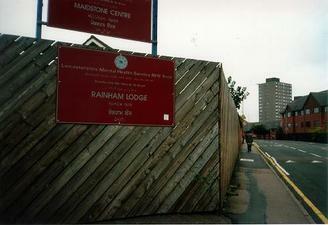 On the right of the photo is the site of the old Workhouse, [in what was Upper Conduit Street and is now Maidstone Road,] where elderly 'gentleman of the road' queued up for food and temporary accomodation.